When biking in Boston, one secret leads to another. My journey got rolling with a tip about the city’s cycle-friendly efforts. History, culture, exercise, no parking hassles? Count me in. Boston’s Hubway bikeshare program launches this July with 600 bicycles at sixty-one stations. Unwilling to wait, I rented a sturdy Kona Smoke commuter bike from Urban AdvenTours, a recently expanded tour company/cycle shop close to the “T” subway stop near Faneuil Hall. Inclement weather doesn’t stop Urban AdvenTours guide Tim Ennis from acquainting me with new bike lanes on Commonwealth Avenue and other central streets, scenic landmark-studded routes, hidden gems, and nearly lost chapters of history. At a car-free Charles River overlook, Ennis recounts the Boston Molassacre of 1919, when a ruptured tank released tidal waves of molasses, killing at least twenty people. Copley Square, named for colonial artist John Singleton Copley, is rimmed by phenomenal buildings. The sixty-story cloud-tickling John Hancock Tower was sited diagonally, allowing sunlight to reach Trinity Church’s stained glass windows. Ennis mentions that some of Hancock skyscraper’s original 10,344 panes popped out due to heat expansion (no injuries; promptly repaired). 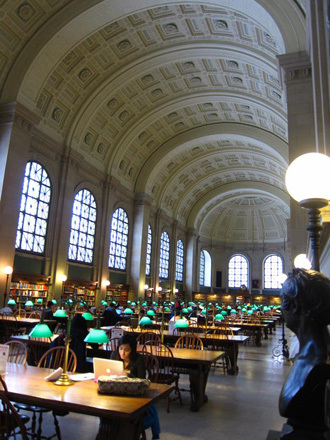 Boston Public Library anchors the square’s west side. Housing 6.1 million books, it’s also a treasury of art. Free admission, free guided Art and Architecture tours, and a free self-tour map. 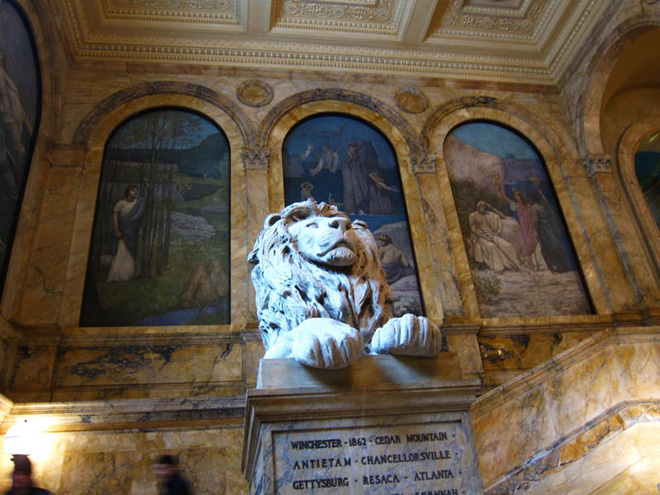 The library’s architectural features include Siena marble lions, gilded domes, dazzling ornamentation, grand staircases, barrel-vaulted ceilings, balcony nooks, polished terrazzo floors, and high arched windows. 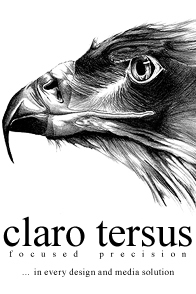 The art? Magnificent, from homages to Venetian masters to the “Goose Girl” frieze tiled from Paul Revere pottery. John Singer Sargent’s epic mural “Triumph of Religion” dramatizes subjects from Judgment Day to obscure figures such as the pagan deity of material things, goddess of sensuality, and the Peacocks of Immortality. 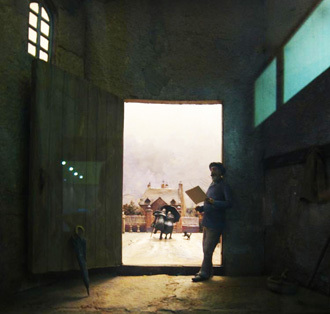 Don’t miss Wiggin Gallery’s back room, which displays exquisite dioramas depicting artists at work. The miniatures, crafted by Louise Stimson of Lexington, include Whistler at Luxembourg Gardens, George Bellows sketching a boxing match, and Rembrandt etching a copperplate. Special library exhibitions running May 16 through September 30, 2011 feature Winslow Homer’s portrayals of rural and wartime America for illustrated weeklies between 1858 and 1873, and Mathew Brady’s Civil War battlefield photographs. Before hopping back on the bike, experience inner-city tranquility in the library’s courtyard, which is modeled after Rome’s Cancelleria Palace. At the Fairmont Copley Plaza, Catie, the resident black Labrador, greets guests from her post in the lobby. 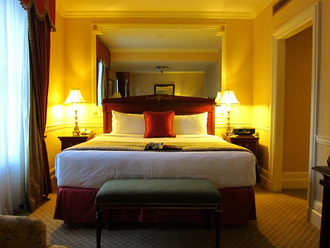 Built in 1912 as the first home of the Museum of Fine Arts, the hotel evokes stately Back Bay townhome grandeur. Who’d have guessed that a lavish, historic property manned by ornately uniformed doormen would set fine examples of bike-friendliness, pet-friendliness, and health-centered dining? Its luxe Oak Room just introduced vegan, gluten-free, and other “Lifestyle” menus. 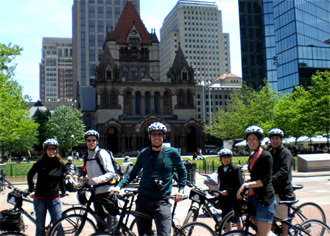 And in partnership with Urban AdvenTours, the hotel offers a lodging-bicycling package through fall. A short ride away is Faneuil Hall. Following an insider’s tip, I climb the stairs to an attic. There I find the Museum of the Ancient and Honorable Artillery Company, with free entry to an eye-popping collection of weaponry: swords, muskets, machine-guns...arrowheads, cannonballs, bullets... plus medals, ribbons, and huge drums used to summon soldiers to meals or battle. On the My Secret Boston website, I discover one of the world’s cheapest cruises: the metro transit system, MBTA, runs the Inner Harbor Ferry from Long Wharf (close to downtown) to the Charlestown Navy Yard. Just $1.70 each way ─ and no extra charge for bicycles. Bike-wise, Boston has come a long way since 2006 when Bicycling Magazine named it among the worst biking cities. Considering how many of the colonial city’s roads were paved over cow paths, I tip my helmet to the planners who added twenty miles of bike lanes and 700 bike parking spaces in 2010 alone. Pedaling back to Copley Square, I stop for nature-spotting at Boston Common. Established 1634, America’s oldest park hosted grazing sheep, military encampments, and witch- and pirate-hangings. These days, it's the start of the Freedom Trail and anchor of Boston’s 125-year-old “Emerald Necklace” of parks. As a result of recent improvements, the necklace now links Charles River Greenway, the mile-long “Walk To The Sea,” the Rose Kennedy Greenway spanning North End to Chinatown, and HarborWalk. Be assured: you’ll run out of time long before hidden treasures. For Fascinating Biking Statistics and Facts head over to the Biking Expert. Hours vary; see their website. A Guest Room at the Fairmont Copley Plaza"
Robin Tierney is an award-winning East Coast writer who explores invigorating, offbeat places primarily by bicycle. All photos are by, and copyright, the author, unless otherwise noted.